The Roadtrax BL Traffic Sensor is designed for permanent or temporary installation into or onto the road surface for the collection of traffic data. The unique construction of the sensor allows direct installation into the road in a flexible format so that it can conform to the profile of the road. The flat construction of the sensor gives an inherent rejection of road noise due to road bending, adjacent lanes, and bow waves of approaching vehicles. The small cut in the road minimizes the damage done to the road, speeds up the installation and reduces the amount of grout used for the installation. The Roadtrax BL sensor is available both as a Class I sensor for the highest level of uniformity needed for Weigh in Motion applications and as a Class II sensor which is more cost effective for Counting, Classifying, High Speed Toll Booths, Speed Detection, and Red Light Cameras. Uniform, high amplitude piezoelectric output compatible with existing counters and classifiers on the market. Excellent Signal to Noise Ratio which has an inherent 10:1 rejection of road noise due to road bending, adjacent lanes and bow waves of approaching vehicles. 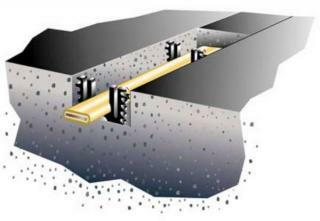 Easy installation in a 3/4 x 1 (19 x 25mm) slot, which minimizes the disturbance of the road, decreases the depth of the road cut, and minimizes the amount of grout needed. Flexible sensor - conforms to any road profile while maintaining a uniform distance to the road surface. The final installation is flush with the road surface - snowplows will not damage the sensor. Durable enough to withstand normal installation handling and hundreds of millions ESAL's. All sensors are 100% tested and certified for performance as a complete sensor prior to shipment. Custom Passive Signal Cable with High Density Poly Ethylene Jacket which is rated for direct burial and resists nicks and cuts.